Will Trump Turnberry's new King Robert the Bruce course reign supreme with our fourball? It's been all change at the Trump Turnberry Resort on Scotland's Ayrshire coast since the billionaire businessman and now American President Donald Trump bought in and took control of the iconic resort. Firstly, Trump spent a King's ransom on completely refurbishing the hotel and then set about restoring the golf courses and making them even better with leading architect Martin Ebert given the task. And a year after the opening of the new-look Open-staging Ailsa course, this summer saw the unveiling of its much-changed neighbour – the former Kintyre, now known as King Robert the Bruce. Founded: Originally set out as the Arran course in the mid-1950s. Architects: Donald Steel (Kintyre, 2001), Martin Ebert (King Robert The Bruce). Vital statistics: Par 72 (7,203yds) from Championship tees and par 72 (6,594yds) from white tees. 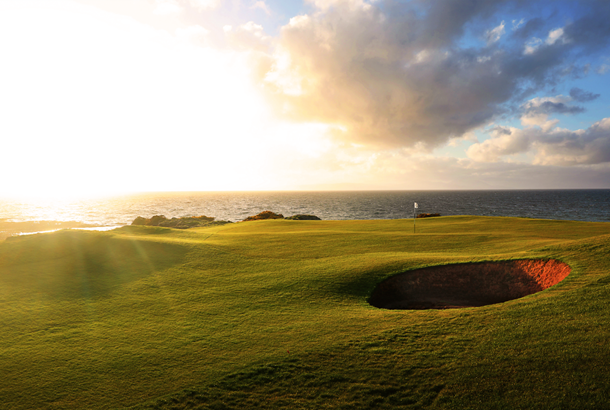 Star hole: The awe-inspiring clifftop par-4 9th. As good as anything you'll see –and play–on the neighbouring Ailsa. Famous for: Being owned by the US president. Location: Maidens Rd, Ayrshire, KA26 9LT. 25 miles from Prestwick airport and 55 miles from Glasgow airport. What did you make of the tees & greens? PO: The tees were in good condition and some afforded fantastic views of the coastline. Greens were excellent – firm, true and fast – and much to my playing partners' chagrin, I had my best putting round in a long time. PM: We played off the white tees. The tees were in great condition and the greens were excellent, quick and true, but not unplayable. NH: Tees were good even though my drive from them would invariably end up in the gorse while the greens were excellent when my ball eventually decided to find them! JC: Tee positions were generally kind although there could possibly be a little more yardage and hole information at some of the boxes. Greens were true and not frighteningly quick. What was the general condition of the course like? PO: I can't fault the design or the condition of the course. The bunkering really stood out with marram grass lipped fairway bunkers and deep - but playable - riveted greenside bunkers. PM: We played on a day when the weather was glorious and the course was in great condition. We played off the white tees which was always going to be tough. NH: Pretty much perfect in my book. Everything was spot on and the bunkers in particular were perfectly manicured. Can you describe the variety of holes and challenges? PO: It's not overly long but the wind direction could be a real challenge. Some very tough holes (8 through 11 especially) coupled with some very scoreable holes. The 9th, over a small cove, is spectacular. PM: There are a number of feature holes but the highlight has to be the stretch from the 8th to the 12th at the far end of the course – stunning views and I somehow managed to par the 9th after a miraculous chip. NH: Generally lovely and attractive holes albeit not quite up there with the Ailsa. That said, the 9th is just amazing as were the final stretch of holes. JC: Conditions were relatively kind on the day so keeping it on the fairway should have been easier than I made it look. I was too busy enjoying the stunning views to take in the 8th, 9th and 10th holes! What about the practice facilities? PO: Taking a few steps from the expansive practice range to 1st tee was a delight and the practice green was the same pace as the course. Also, excellent short game area to the right of the 1st tee. PM: They are absolutely first rate with excellent putting and chipping greens and an extensive driving range. You could easily spend a day just using all of the practice facilities! NH: Best practice facilities I've ever seen! Not just a driving range but a massive pitching area plus some great fun putting area. JC: Easily accessible and well located for progress onto the 1st tee and the complimentary pouch of range balls is a nice touch too. Booking and welcome to the club? PO: Very friendly staff who could not do enough for us. From concierge at the entrance to pro shop, to restaurant staff and starter, the service was faultless. PM: No problems whatsoever and we received a warm welcome with polite staff in the pro shop. NH: Very friendly without being at all snooty or subservient. Everyone was helpful and happy to have a chat. JC: No complaints here – we received a friendly welcome and the staff were personable and polite throughout. PO: Limited breakfast menu – I would have liked to see Scottish oats and kippers on the menu. The table in the far left corner of the Duel in the Sun restaurant afforded stunning views over both courses. PM: We had a great breakfast in the clubhouse's 'Duel in the Sun' restaurant with magnificent views across the links. NH: Tasty breakfast that included haggis so top marks. Could have had a sausage sandwich for £4.95 so it's reasonably priced. JC: Really enjoyed the breakfast of a perfectly poached egg and black pudding and coffee. Unfortunately we didn't indulge post-round! What were the Locker Rooms like? PO: Spacious lockers and a very high specification fit out. Cannot fault the locker room experience. PM: The changing rooms are spacious and clean with plenty of lockers available. NH: Again very nice and smart – just what you would expect from a place of this stature. JC: You can't say anything else other than plush, comfortable and clean. Would you say it was value for money? PO: Cannot help thinking that it suffers from being second string to the Ailsa course. It is a very good course in its own right and arguably much better value. It makes for a superb addition to a good value Ayrshire golf trip. PM: The green fees (see above) are what I would expect given the standard of the course, the fact it's Turnberry and the exceptional views. NH: Given the majesty of the venue and how it is presented, you expect to pay a good price for the golf. However, everything else seemed well priced and slightly cheaper than I would have expected. JC: In my view, it's priced at the right level, meaning anyone can experience a genuinely top quality golf course. PO: With fantastic weather, a close fourball better-ball and all the above positive attributes, I had a great day and will definitely look to play the course again. PM: Playing this fabulous course was a real treat. Turnberry is an iconic Scottish links and certainly lived up to expectations and didn't disappoint. NH: I've been to Turnberry a number of times, working and playing, and it does have a special place in my heart... and I even forgive the golf balls it's stolen from me! JC: It's definitely worth the trip...and worth a trip again, hopefully in the not-too-distant future.